Kuvale Dhavi Randayi is a very simple and mild dish. 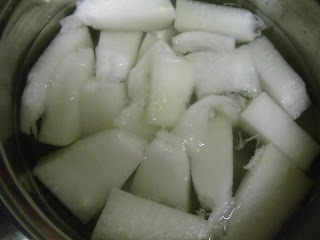 In konkani Kuvale means Ash gourd and dhavi randayi means white curry. I got this recipe from my mother-in-law. She told that this curry is served as a prasadam in the nearby temple on the ocassion of Subramanya Shashti. When I heard the recipe for the first time, I was doubtful about its taste. The reason being ash gourd is bland and to add to that, only one red chilli for the masala! How would it taste?! Then I tried making it. Trust me it tasted very good. It has a very different taste. Addition of roasted fenugreek seeds gives it a very different taste. Try making it to know how different it is! *You can as well use Yellow cucumber instead of Ash gourd. **This is a very mild dish. So don't add more red chillies. You have to add absolutely only one red chilli. Remove the seeds and skin of ash gourd. Chop it into bite size pieces. Cook these pieces in a cooker adding little water and salt, for one whistle (you can as well cook in a small vessel). Meanwhile dry roast the methi seeds until a nice aroma is got. Allow it to cool. For masala: Grind the grated coconut along with red chilli, tamarind and roasted methi seeds. Make a fine paste by adding water as required. 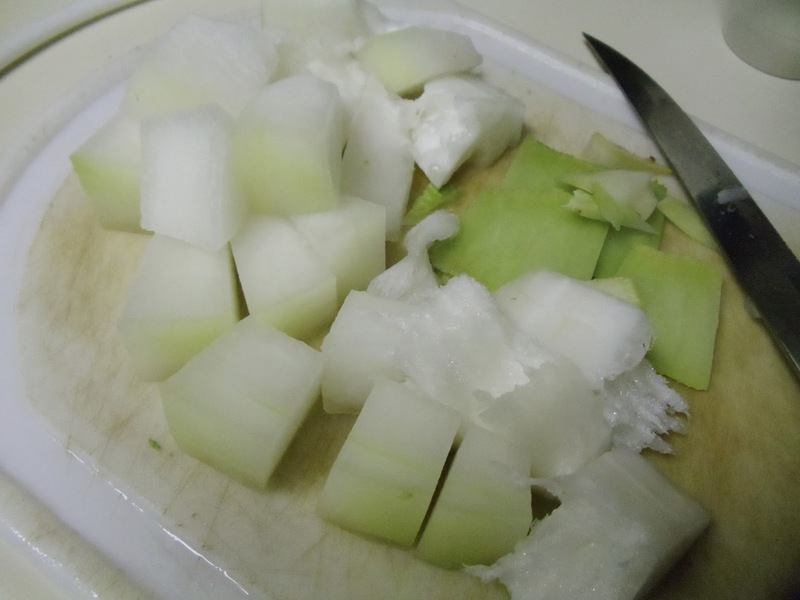 Add this masala to the cooked ash gourd. Mix it well. 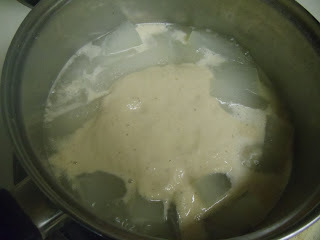 Adjust the consistency of the gravy to medium thick (or as required) and then bring to a boil. Once it comes to a boil, continue heating for 3-4 minutes. Turn off the heat. For Seasoning- Heat oil. Then mustard seeds. After it starts spluttering, add curry leaves and turn off the heat. Add this to the curry and mix well. Kuvale Dhavi Randayi is ready!! This is a buttermilk-less version of our traditional moru-curry. We have a 'pulinkari' with the same combination you have used here. Thanks for sharing the recipe. oh wow...didn't know about it Shri.Thanks for letting me know. Try making this version as well..